Machine Learning professor, Ziv Bar-Joseph, is part of the research team from the Salk Institute for Biological Studies and the School of Computer Science's Computational Biology Department who discovered what happens on a molecular level when plants need water. This discovery could be critical to helping agriculture adapt to climate-related stressors such as drought and also in developing new technologies to optimize water use in plants. The new research suggests that in the face of environmental hardship, plants employ a small group of proteins that act as conductors to manage their complex responses to stress. In their study, the researchers used computational methods developed at CMU to integrate large and diverse datasets that profiled real-time changes in plant genetic activity in response to abscisic acid (ABA), a plant hormone involved in seed development and water optimization. 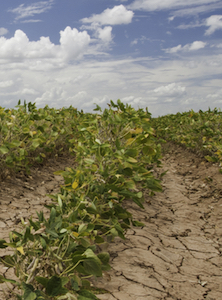 The resulting models identified a handful of master proteins that govern responses to a wide range of external stressors, including drought. Using a technique that maps where these regulatory proteins bind to DNA, the team defined key factors that coordinate gene expression, allowing for an efficient cellular response to changing conditions. "'The large amounts of data generated by new genomic profiling methods, and the fact that several aspects related to cellular activity can now be measured using these methods, raises new computational challenges," Bar-Joseph said. "Machine learning methods for analyzing and integrating molecular data allow researchers to obtain comprehensive models that provide insights and raise new hypotheses about the way plants handle stress." While the focus in this study was on plant response to drought, Bar-Joseph believes that the methods developed for this work are more general and can be used to study other biological processes including immune response and disease progression. The results of this research study are detailed in the Nov. 4 issue of Science.